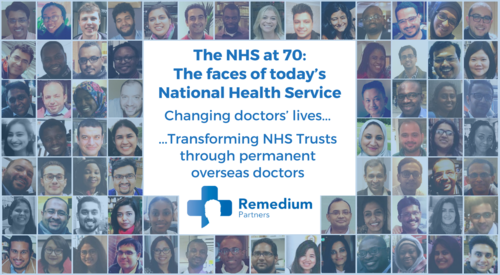 Remedium Partners - a consultancy which specialises in helping overseas doctors relocate and continue their professional development in UK hospitals – is celebrating the 70th anniversary of the NHS by sharing the images of 70 of the 600+ permanent doctors it has placed, each of whom have played a vital role in supporting the health service of today. “Today marks an incredibly exciting milestone for the NHS, the patients it serves and the talented individuals that make up its workforce. And while it would be remiss to suggest that this great British institution is not without its challenges, we are taking this opportunity to celebrate the vital contribution that overseas doctors have played in shaping today’s workforce. “The NHS has long relied on the knowledge and expertise of this rich talent pool, many of whom relocate their entire families and lives when they start work in the UK. 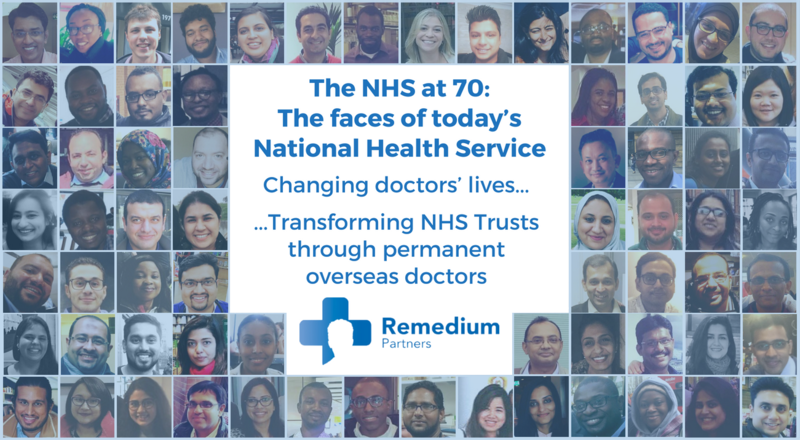 Since our inception in 2013, we have placed over 600 permanent doctors into hospitals from a range of countries – including India, Dubai, Trinidad & Tobago, Nigeria, the Philippines and Singapore – and have seen first-hand the vital contribution they make to the NHS. Not only do these doctors bring a much wider range of skills, knowledge and professional experiences gleaned from their home nations, but they also help Trusts alleviate ongoing talent shortages and save huge amounts on their agency locum spend. Established in 2013, Remedium Partners is fast becoming one of the leading providers of permanent and fixed-term doctors into the NHS. At Remedium Partners, we believe that placing permanent and fixed term doctors, rather than locums, saves the health service time and money. Having placed over 600 doctors since we were founded, we estimate to have saved the NHS in excess of £50M. This press release was distributed by ResponseSource Press Release Wire on behalf of BlueSky Public Relations Ltd in the following categories: Health, Medical & Pharmaceutical, Public Sector, Third Sector & Legal, for more information visit https://pressreleasewire.responsesource.com/about.